Beautiful job done by a beautiful blogger. I’m proud to be part of your family! UhOh–I didnt nominate you for the Warrior Award BUT YOU DEFINITELY ARE !!! I wanna know what THAT ones all about!? You’re right up at the top of my fav family list Momma! I LOVE chatting with you here and reading your stories! You bring much comfort to me that I dont find in my own outside world. You are very appreciated! Lol! Soo cute ;) you’re a special lady –you gotta check out the others when you get a chance! The award was actually just created by the gentleman that sent it to me. I love Cranky Granny–there’s no one like her! (& the rest but I’m just sending this according to taste)! LOL I found you Momma! I am sooo glad to! You have a big heart and it speaks to the right parts of us all. You can send it to whom you like..There are no Copyright issues.. 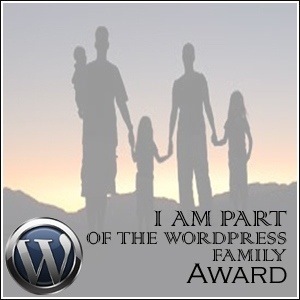 If anything this Award “PROMOTES” Word Press..It has been on the go for 4 months and no issues..Yeah send it. I think it’s because I have 140 awards..so I was told.. I don’t really care. The person was childish and rude. People come here to care and help, and all this award, out of the other 200+ created by other users fly about no problem. We are all a part of Word Press, maybe 1 or 2 are just a BIT too much a part.. lol.. I help with a Facebook, Word Press page to help people who are new here to work it. So, again, we are all here to help. I lose no sleep over people who think they are above other people. If I was to tell you I was a Multi Millionaire, would you treat me any different? No I don’t think you or anyone else does…Nice place here..
wel, after the morning from hell (with no shouting allowed from me) THIS is great! It has made me smile and cheered me up no end. Thank you so much. Thank you so much for the mention! You seem like an extremely nice person and great mom AND you are very beautiful. Your kids are so lucky to have you and I’ve been reading about your Not yelling rule parenting style – pretty amazing. I guess you should know, though, I don’t have any kids…but I’m very fortunate because I work with about 530 amazing ones!Thanks again! LOL, Im so like that–skip the facts and get to the goods lmao! Well, you deal with MORE children than I have so you’re a qualified mother to ME! I just adore your shares so much! Keep on pushing hunny, one this too shall pass! and thanks for the clarification lol! More Blogs for me to follow. Thanks for this post & congrats on the award! !